Attractions in Kirkby Stephen, Cumbria. A small rural art gallery showing original oil paintings and prints by Sandra Parker, Yorkshire Dales sheep artist. Many bespoke rural gifts also available. Situated at the half way point on the famous 'coast to coast' walk it is a popular stopover location and the studio is visited by many walkers from the UK and abroad. Mainly fell breeds of sheep are exhibited namely Swaledale, Rough Fell, Herdwicks and Texels. On Monday 22nd April 2019 the sun will rise at 05:49 and will set at 21:52. It will be a mild day, with temperatures reaching around 9.2°C. Heavy rain which could cause some standing water is expected, 10mm of rainfall is possible today. Some quite strong winds are possible today, with a maximum expected wind speed of 59mph. On Tuesday 23rd April 2019 the sun will rise at 05:45 and will set at 21:55. It will be a mild day, with temperatures reaching around 9.1°C. Today is expected to be a dry day, with a very low chance of rain. It could be quite a gusty day today, with a maximum expected wind speed of 37mph. On Wednesday 24th April 2019 the sun will rise at 05:41 and will set at 21:59. It will be a mild day, with temperatures reaching around 11.6°C. Today is expected to be a dry day, with a very low chance of rain. It could be quite a gusty day today, with a maximum expected wind speed of 34mph. On Thursday 25th April 2019 the sun will rise at 05:37 and will set at 22:02. It will be a mild day, with temperatures reaching around 11.6°C. Today is expected to be a dry day, with a very low chance of rain. It will be quite a breezy day, with a maximum expected wind speed of 31mph. On Friday 26th April 2019 the sun will rise at 05:34 and will set at 22:06. It will be a mild day, with temperatures reaching around 9.9°C. Today is expected to be a dry day, with a very low chance of rain. It will be quite a breezy day, with a maximum expected wind speed of 23mph. On Saturday 27th April 2019 the sun will rise at 05:30 and will set at 22:09. It will be a mild day, with temperatures reaching around 10.8°C. Today is expected to be a dry day, with a very low chance of rain. It could be quite a gusty day today, with a maximum expected wind speed of 34mph. On Sunday 28th April 2019 the sun will rise at 05:26 and will set at 22:13. It will be a mild day, with temperatures reaching around 8.3°C. A light shower is possible, 2mm of rainfall is possible today. There will be a gentle breeze in the air today, with a maximum expected wind speed of 12mph. 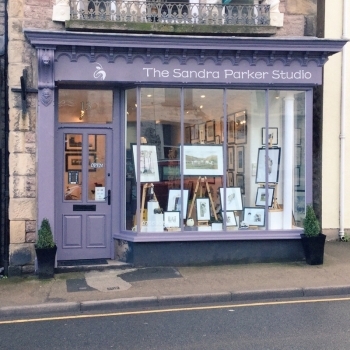 A small rural art gallery showing original oil paintings and prints by Sandra Parker, Yorkshire Dales sheep artist. Many bespoke rural gifts also available. Situated at the half way point on the famous 'coast to coast' walk it is a popular stopover location and the studio is visited by many walkers from the UK and abroad. Mainly fell breeds of sheep are exhibited namely Swaledale, Rough Fell, Herdwicks and Texels.